The ideal solution for high volumes of paper. 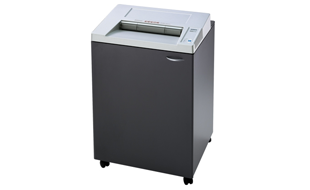 FORDIGRAPH 3140, the ideal solution for high volumes of paper. High sheet capacity and continuous operation due to powerful 1300 watt motor. Features multifunction control element with integrated optical indicators for the operational status of the shredder. Automatic start/stop photoelectric-beam control. Patented ECC (Electronic Capacity Control) indicates used sheet capacity during shredding process. Interested in the Fordigraph 3140?